An excellent 1855 first edition example of Colton's map of Boston, Massachusetts. 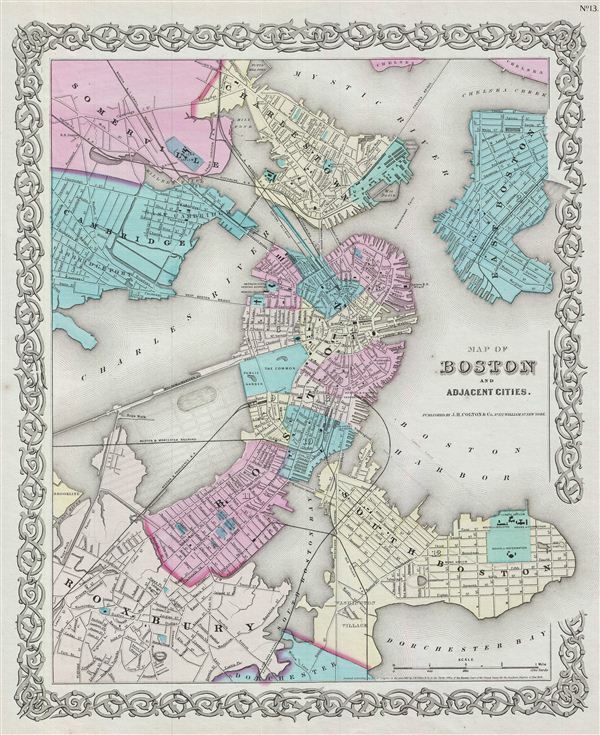 The map covers the entire city of Boston including the surrounding communities of Cambridge, Summerville, Charleston, east Boston, South Boston and Roxbury. Color coding identifies various city wards and districts. This is an exceptionally interesting and important map of Boston issued just prior to the Back Bay land reclamation projection. The street and avenue grid is ghosted-in in anticipation of this enormous urban development project. Modern residents of the Back Bay may still recognize the Mill Dam (Beacon Street) and the various railroad crossings. The rest of this projection, with its large oval pond, may be more confusing. This layout is based on the real estate ambitions of David Sears, who acquired much of this property in anticipation of the impending landfill. He believed the lake, which never materialized, would make adjacent properties more desirable. Map is hand colored in pink, green, yellow and blue pastels to define boundaries and is extremely detailed showing individual streets, buildings and parks. Surrounded by Colton's typical spiral motif border. Dated and copyrighted to J. H. Colton, 1855. Published from Colton's 172 William Street Office in New York City. Issued as page no. 13 in volume 1 of Colton's 1856 Atlas of the World.